I’m all for dinner snacks these days. It’s too damn hot to even consider turning the dial on the stove. I’m busting out in a sweat just thinking about it. Not only that, but I’d much rather spend my time soaking up the sun and swimming laps in the new pool my mama and brother recently purchased. The men folk got together last weekend to install the pool, so I’m all in and ready to swim every. single. day. I’m pretty sure pool snacks are an absolute must, so I made a big ol’ batch of Pesto Hummus with Roasted Cherry Tomatoes. So, hop on your float and paddle your way over to the snack barge and get to dippin’! Yes, we have a snack barge. Well, really, it’s just an inflatable boat that I filled with ice. Same thing! Let’s chat about this ultra smooth hummus. I used the same step-by-step instructions that were verbally issued to me by one of my very nice Mediterranean patients back when I worked in ophthalmology. Basically, it’s the real the deal. If you wanted to take the authenticity up a notch, you could soak a bag of dried garbanzo beans, but who has the time? Let’s all just grab a can of garbanzo beans and get on with it. Step 1: make hummus. Step 2: prep basil pesto. Step 3: roast cherry tomatoes. Step 4: combine the goods. Step 5: toast a few pieces of pita bread. Step 6: dip, eat, repeat. This Pesto Hummus with Roasted Cherry Tomatoes is big on flavor. It’s the perfect summer appetizer, snack, or, as I often dish it up, dinner. There’s nothing easier than grabbing a bowl of hummus out of the fridge and toasting up a batch of pita chips. It’s extremely satisfying, filling, and super healthy. If you’re looking for more healthy snack options, try this Pesto Hummus with roasted Cherry Tomatoes on this Veggie-Loaded Flatbread Pizza or Mediterranean Grilled Veggie Pita Pizza. Preheat oven to 400 degrees F. Add the cherry tomatoes in an even layer to a large baking sheet. Drizzle with olive oil. Using your hands, gently roll the tomatoes around to coat with the oil. Sprinkle with a few generous pinches of salt and pepper. Bake for 30-35 minutes, or until the tomatoes are wrinkled and tender. Set aside to cool to room temperature. 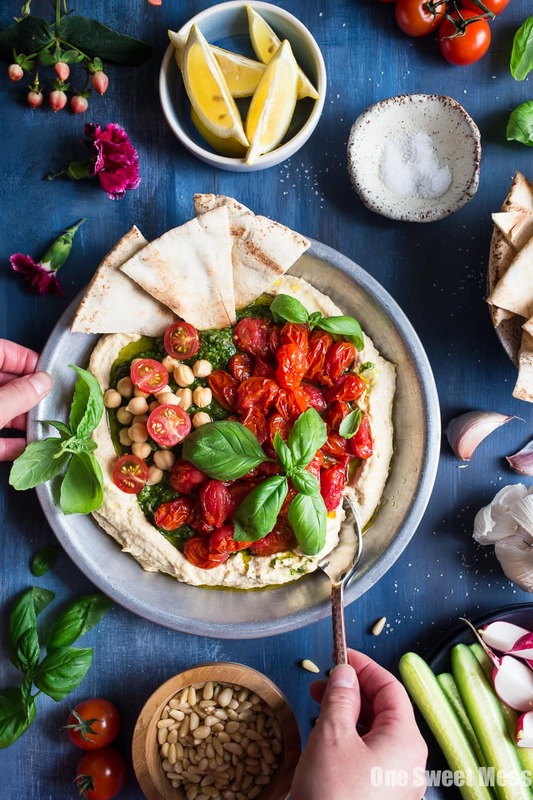 While the tomatoes roast, prepare the hummus by adding the garbanzo beans, garlic, tahini, lemon juice, salt, and cumin to the bowl of a food processor. Pulse until smooth. With the processor on, slowly drizzle in the reserved bean liqueur until the mixture is smooth and fluffy (I used all of the reserved liquid). Continue to process while slowly drizzling in the olive oil. Season with salt to taste. If you’re serving the hummus immediately, transfer to a large platter or shallow serving bowl. If you’re not serving immediately, transfer to an airtight container and store in the refrigerator until ready to use. To make the pesto, add basil, garlic, red pepper flakes, parmesan cheese, pine nuts, and lemon juice to the bowl of a food processor. Pulse to combine. With the processor on, slowly drizzle in the olive oil. Season with salt and pepper to taste. If serving immediately, spoon the pesto over the hummus and arrange the roasted tomatoes on top of the pesto. Garnish with chopped basil and a sprinkle of grated parmesan cheese. Serve with a side of toasted pita chips. If you’re not serving immediately, transfer both the pesto and roasted tomatoes to separate airtight containers and store in the refrigerator until ready to use. If you’re not serving the hummus immediately, all of the elements to the dish can be prepared up to 3 days in advance. When you’re ready to serve, add a layer of hummus to the bottom of a platter or shallow serving bowl. Spoon the pesto over the hummus and arrange the roasted tomatoes over the top. Garnish with chopped basil and grated parmesan cheese. The hummus is delicious cold or room temperature. Leftovers will stay fresh in an airtight container in the refrigerator for up to 1 week.